It’s a little misleading to call them sun-dried because they weren’t actually left out in the sun. But I did dry them on Sunday. We planted twelve store-bought tomato plants this year. About the same time we spread composted soil in a nearby section of the garden and planted green beans in the new soil. 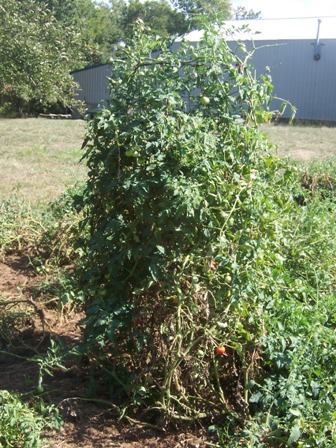 Soon, up sprouted the beans along with dozens of volunteer tomatoes. As they grew, we dug holes in the grass outside the garden, plucked the young tomato plants out a few at a time, and stuck them in the holes. After we’d replanted about three dozen, I mowed our three acres, bagged the whole thing, and used the grass clippings to mulch around the plants. approach (or laziness, whichever you prefer). The wildlife and insects ate most of our garden last year, so I didn’t expect to harvest much, even with so many tomato plants. We couldn’t justify spending too much time on them when the chances of them producing much seemed pretty slim. By the time they bore fruit, they’d taken over – we couldn’t even walk among them without stepping on vines and green tomatoes. A few days later, we could see a few bright red spots among the tangled web of vines and foliage. It was time to wade in. Because they’d lain on the ground, some of the ripe fruit was rotten, so we did our best to separate the plants and keep the ripening fruit off the ground. Our first harvest we canned seven pints. After our second harvest, we canned twenty quarts, which is about twenty more than I expected to get! As for our store-bought plants, we got two or three tomatoes total. Between the bugs and the rabbits, they didn’t fare well. The marigolds we planted next to the tomatoes did great, but they don’t taste as good. We’ll enjoy our “sun” dried, volunteer tomatoes though, all winter long.